A Bold New Beginning. Now, for the first time on Blu-ray, follow Starfleet's earliest forays into deep space in breathtaking 1080p high definition picture and English 5.1 DTS-HD Master Audio. Captain Jonathan Archer (Scott Bakula) commands the Enterprise NX-01, the first Earth-built vessel capable of breaking the Warp 5 barrier. With his trusted Chief Engineer, Charles "Trip" Tucker III (Connor Trinneer), Science Officer T'Pol (Jolene B..
Episodes Broken Bow: Mission Date April 16, 2151 Pursued by mysterious aliens, a Klingon pilot crashes on Earth and is shot by a farmer. Seizing the opportunity to break years of stalemate in Earth's space program, Jonathan Archer quickly assembles a crew to return the injured Klingon to his people using Earth's first Warp 5 starship, "Enterprise". When the ship is attacked, the Klingon is abducted, and Archer's crew is drawn into an in..
Where No One Has Gone Before. 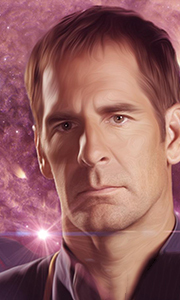 Beginning with the resolution of season one's epic cliffhanger, experience the adventures of the Enterprise NX-01 crew as Captain Jonathan Archer (Scott Bakula) and his crew explore the far reaches of space long before the United Federation of Planets was formed. The crew is tested as Chief Engineer Charles "Trip" Tucker III (Connor Trinneer) is abducted while Science Officer T'Pol (Jolene Blalock) struggle..
Episodes Shockwave, Part II: Mission Date Unknown While the Enterprise is overrun by Suliban, Captain Archer, trapped in the far future, finds that his own removal from the timeline is the cause of the devastation he witnesses in the 31st century. Carbon Creek: Mission Date April 2152 Taking issue with the history books, T'Pol recounts how her great-grandmother took part in the actual first contact between Vulcans and humans, in the s..
After a surprise attack on earth leaves over seven million people dead, Captain Jonathan Archer (Scott Bakula) and the crew of the Enterprise swear to find those responsible - the Xindi. Taking off into the uncharted region known as the Delphic Expanse, the crew of the Enterprise must hunt down the Xindi and stop them from enacting their ultimate plan: the total destruction of humanity. Along the way, they travel to the year 2004 to pre.. The Xindi: Mission Date Unknown Seeking the elusive Xindi race, Archer and his crew are aided by a ruthless alien mining foreman with a gruesome trophy, while Reed clashes with the new military officers stationed aboard Enterprise. Anomaly: Mission Date Unknown Disabled by the terrifying spatial distortions of the Expanse, Enterprise encounters a dead ship, which has been stripped of its assets by unscrupulous scavengers. Before long,.. In the harrowing final season of Star Trek: Enterprise, timelines collide as Captain Jonathan Archer continues to lead the exploration into the unknown, as well as rally support to form a coalition of planets in an attempt to prevent intergalactic war. In a season rife with danger and suspense, both Starfleet and the crew of the Enterprise are put to the test as they encounter genetically engineered humans, deal with an alternate "mirro..
All four thrill-packed seasons of Star Trek: Enterprise are yours to explore as Captain Jonathan Archer (Scott Bakula) pilots the Earth’s first Warp-5 capable ship, Enterprise NX-01, on a long-range mission of research and discovery beginning in the year 2150. During his command, Captain Archer and his crew will face life-threatening challenges from the Xindi, an enemy bent on annihilating humanity via a planet-destroying super weapon, ..
Episodes Storm Front, Part I: Mission Date Unknown Transported back in time to 1944, the Enterprise crew witnesses a disastrous version of World War II in which the Nazis, aided by sinister aliens, have invaded the United States and now control the White House. Storm Front, Part II: Mission Date Unknown Battling to prevent the Nazi aliens from completing the time machine which will allow them to inflame the Temporal Cold War, Captain ..
Own Star Trek - Enterprise Seasons 1 to 4 Complete Collection DVD from Deff, DVD, Blu-Ray & 4K Video Specialists - Free UK Delivery..